In the last year or so I've been doing some event photography, and short YouTube videos using my iPhone 4S. I used an adapter called a Glif to connect my iPhone 4S to a tripod. There were other adapters, but the Glif had a very simple, yet clever design. The ShoulderPod S1 has an added grip that screws into the tripod mount, along with a wrist strap, that makes the S1 a steady grip for still photos, as well an incredible aid for filming. Imagine the ease and smoothness of pans, and the extra stabilization for zooms. This is a simple, but powerful tripod holder/grip for improving photos and filmmaking with your iPhone 6 or other camera-equipped phone. 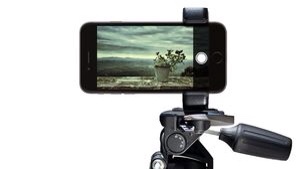 As an added bonus, the ShoulderPod S1 serves as a stand for the phone. Handy, but not really a big deal or a reason to buy the S1. 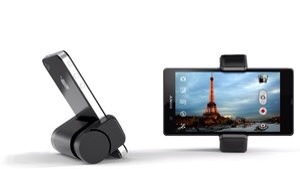 Not until you figure out that as a stand, the S1 also serves as a desktop tripod on its own. A tripod when you don't have a tripod? Cool. I may not have made this clear, but the ShoulderPod S1 works with the iPhone 6, the iPhone 6 Plus, and most other cell phones out there with a case or without a case. Naturally, you'll want to check dimensions for yourself, but it's most likely to fit your device. Upon second thought, if you don't have a camera on your phone…well, if you don't have a camera on your phone you need a new phone. Then get yourself a ShoulderPod S1. You can order online from the manufacturer or through Amazon.com. 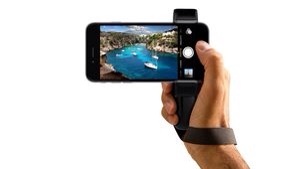 This entry was posted in Products and tagged film, filmmaking, grip, iPhone, photography, photos, stand, tripod, tripod mount, video. Bookmark the permalink.